I visited a friend of mine. Although she’s living in another city I used to visit her at least once a week. Now it was for the 1st time in months. 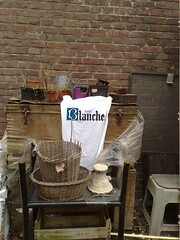 It was part of my space, my Zijperspace, so I took some shirts with me & tried to grab. Grab, yeah, grab. Grab something. I don’t know what. Grab what’s me, parts of me, picturewise.